I’m loving my e-course the Art and Business of Surface Pattern Design! We were asked where we’d like to see our designs. This sent me into a fantasy of seeing drab pavements decorated with multi-coloured Dee Designs. As well as seeing my designs in Paperchase of course! ..Dee…my very first post on my very first blog! The patterns here are my very first attempt at such a thing, inspired by the course I have just embarked on The Art and Business of Surface Pattern Design. I hope to be posting a lot more on the blog: drawings, doodles, thoughts, poetry, rambles, rants, as I begin this creative journey – Watch This Space! 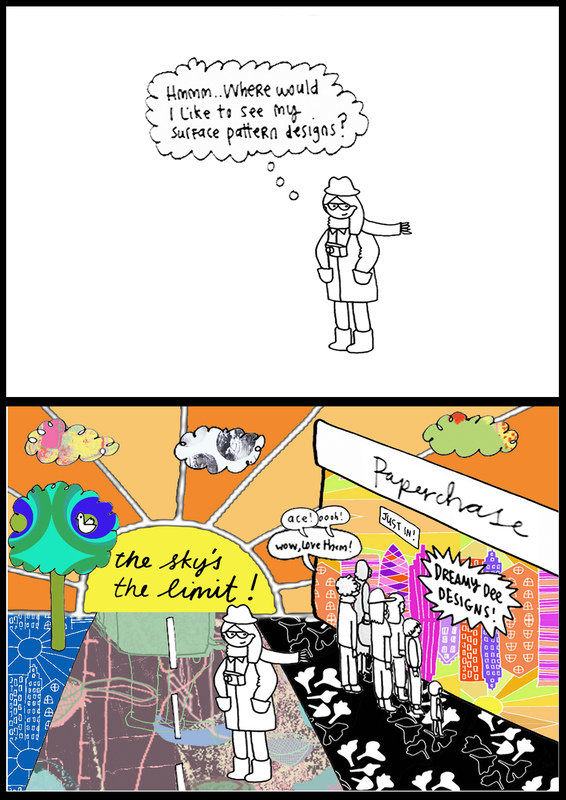 To begin with I want to start with a little cartoon which reflects upon the most common response I get when I tell people I’m starting a surface pattern design course. ‘What’s that?’ they ask. It seems that the world of surface pattern design is a mystery to most. Or most people I talk to anyway! I can understand that. The terms ‘graphic design’ and ‘illustration’ are widely understood. Surface design is a term you hear less. And yet it is all around us, as my cartoon highlights! I enjoyed drawing that! 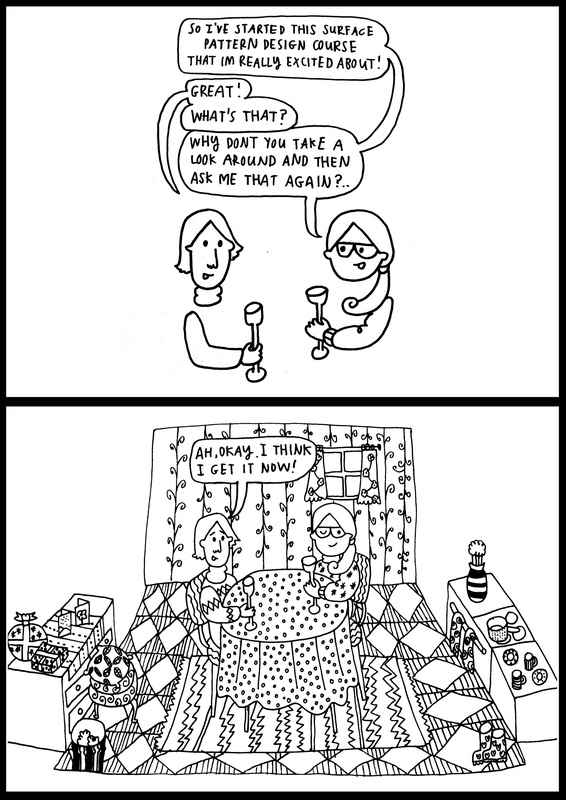 But I’ve realised that drawing a cartoon about my surface pattern design course is keeping me from completing the work (*play, actually – it’s fun! *) on my surface pattern design course. So I best get on with it! Off to draw some leaves now….